Why have I not thought of a grilled turkey sandwich before?! That sounds so good. I just looked and have everything to make it too! Well, except I’ll have to use sharp cheddar but, it still sounds good. Your pictures I can’t resist :) Off to make my midnight snack now! It’s probably my favorite grilled cheese so far! Hope you enjoy! And I’d say cheddar would be great! You are so smart! I bet it was almost like Thanksgiving in a grilled cheese! You so should blog it. Did you leave out the maple since you had the cranberry relish? PS that cranberry sauce is on my blog (it has pecans though, and I think I might have added a little more sugar to the relish since I wanted it to almost be like a jelly) but I call it “sauce” on here and relish on the jar b/c I wanted you to think of it for more uses than just alongside your turkey and I thought the word change would help. I’m so weird. I didn’t add the maple, just because I didn’t want it…lol! I also didn’t have any onion. So it was just turkey, sharp cheddar and cranberry relish on whole wheat. I’ll be making another tonight for dinner and will get a pic so I can blog it and I will link to you too!! :) Both this sandwich and your sauce! This is a delicious pick! I, too, am hungry again. So bummed to see you leave SRC! Thanks for making Group C a blast. Hope to “see” you soon! Aw, thank you Christina! I was honored with your post last month and am so happy to have met you through the SRC! Veronica: What a grilled cheese!!! I am salivating like crazy and wishing to have it all for myself. What a stunning sandwich!!! Great pick for SRC. :'( Thank you Liz, it means a lot that so many say I will be missed. I do love the SRC but life is changing and I no longer want the commitment when I have so many others, so I figured I should let someone on the waiting list take my spot. I will miss you but will check in on you too! So sad you’re leaving SRC! What a great sandwich!! We’re all about sandwiches here and this clearly is not your average, ordinary grilled cheese! So good! omy..I don’t think I have ever seen a better and tastier grilled cheese than this. Yum! This sandwich looks incredible!! And such an amazing combo of flavors. I absolutely <3 gouda cheese. Smoke it and I'm in heaven! Yum, yum, yum sandwich! I almost bought smoked gouda for it, but I was afraid it might be too much. Maybe next time! Now that is my kind of grilled cheese! My dad used to make something like this for me when I was little but we used a caramelized onion jam! Off the hook! Yum yum! Great choice for Grilled Cheese Month! Aww you’re so sweet! So exciting that you got my blog!!! And you chose a great recipe, I LOVED that grilled cheese. I’m so sad to hear that you won’t be back for SRC next month… we’ll miss you! Sad I never got assigned your blog but I’ll still be following you anyway and will still make your recipes of course! And how interesting to add in the maple syrup, glad it didn’t ruin it for you! We have the Private Selection maple turkey brand at our local grocery store. It’s soooo good! Way to go out with a bang, V! Love your photos too! I need to make this again and get better pics. Aww and I saw your comment that it’s probably your fave grilled cheese so far… honored! That means a lot coming from you girl!! Thank you, I know I’m going to miss it a lot. Lately the SRC has been the only thing keeping me posting recipes so I’m kinda scared I won’t blog at all now. But I will do my best. Our Dillons store has the Private Selection brand but of course we were shopping at Walmart instead so I couldn’t find it-duh! Will get it there next time. Cuz I need this sandwich again. :) It really is my fave–you rock the grilled cheese! Yum, this sandwich looks delicious. There is nothing better than a grilled cheese sandwich- I will definitely have to make one before this month is over. This looks fabulous! Gouda is my favorite cheese, and the flavor combinations sound amazing. It’s grilled cheese night at my house and I’m thinking this will be my sandwich of choice! YUM! and I love how stacked that meat is…can just imagine how tasty it is to bite into this masterpiece! What a yummy grilled cheese! Great day for it! Well, you’re going out with a bang, my girl! This looks delicious. So sorry you won’t be a part of Group C with me, but I know you are super busy. How is the cupcake business going? I know I will miss it, and it will be hard to force myself to make recipes from friend’s blogs without the assignment and deadline, but I really do hope to continue on my own. It’s going great, thanks! This is some SERIOUS comfort food here, Veronica!! Nothing in the world like a gooey grilled cheese, and I LOVE me some gouda! Bookmarking this one now!! Your photos say it in one word… YUM! WOW – this is one tasty sandwich and a must make soon. Glad to be part of SRC group C with you! I love this! I’m going to have to go caramelize some onions & whip one of these up for lunch! Yum and so clever of you to tie into National Grilled Cheese Month! I shared a Grilled Cheese Donut recipe on National Grilled Cheese Day but your post reminded me I have one more grilled cheese sandwich that I better get to sharing this month, too! Here’s some gooey Gouda love back atcha, Veronica! :) Very creative touch adding the maple to the caramelized onions… the whole sandwich sounds terrific! What a Gouda sandwich this is! Hello grilled cheese any sandwich! That maple syrup sounds perfect with the gouda and turkey! 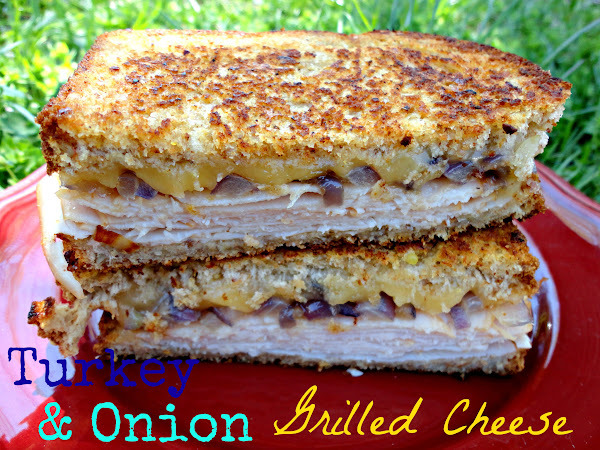 This looks awesome, I never thought to use turkey in grilled cheese but it looks perfect. Say it isn’t so Veronica! Don’t leave us. :( I know, that’s totally selfish. But really, you will be GREATLY missed here. I hope you still come back and visit us! Your posts and comments always make me smile and crack me up too! oh, and your grilled cheese looks and sounds YUMMY. P.S. did you notice we both used the word “stalk” crossed out in our descriptions of SRC this month? Kismet? Great minds? Soul sisters? LOL. Take care and don’t be a stranger. That is one good looking grilled cheese my gosh! Lots of yummy flavors in there, a must try recipe! Oh grilled cheese how I love thee! This sounds like a great variation on a classic! p.s. Canadian maple syrup is in season right now! I’ll put this one on the list!